I have studied Bramah and his locks for sometime now, yet there are a few nagging questions that I have never been able to gain clarity on. I am wondering if anyone may be able to help fill these gaps? 1. Did Bramah's lock patent expire in 1812 (1798+14 years)? If so, am I correct in assuming that after this time other locksmiths were free to copy his design? 2. Did the presence of the term 'Patent' stamped on the lock surface, denote that the lock wasn't actually made by Bramah themselves? The reason I question this is that many locks display 'Bramah - 124 Piccadilly - Patent' on them which makes it seem that they are indeed manufactured by Bramah. 3. Besides a blank lock plate surface, what other text might one see stamped on a Bramah 'copy' lock? By using the term 'copy' I refer to any lock not made by Bramah themselves. Have you thoroughly searched everything Bramah on here as going from memory there's most things covered about patents dates, addresses, copies etc oldlocks made brilliant posts over the years but many are tucked away in threads. I thought I did, but I am going to go another search then. As you recommended, I did a more exhaustive search of Bramah in these forums; there is indeed a wealth of information here! Had an enjoyable evening going through it all. 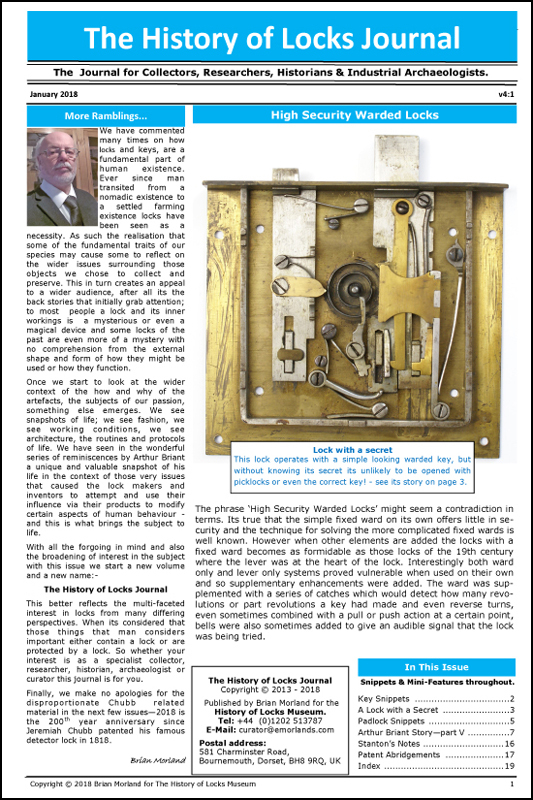 What is still not clear is whether the inclusion of the mark of ‘patent’ on a lock means it is a copy, or whether it is a genuine Bramah and is simply stating that it is his patented design? Is there any way to establish if a lock is a genuine Bramah from just its text markings? The company will supply new locks and replacement keys to anywhere in the world. Is this table implying that the relevance of the lock markings from 1798 (shown in the right column) carry on through until 1871? The reason I ask is that the right column remains blank until that point. If this is the case, does that mean that any lock marked 'patent' that dates after 1798 is a copy?